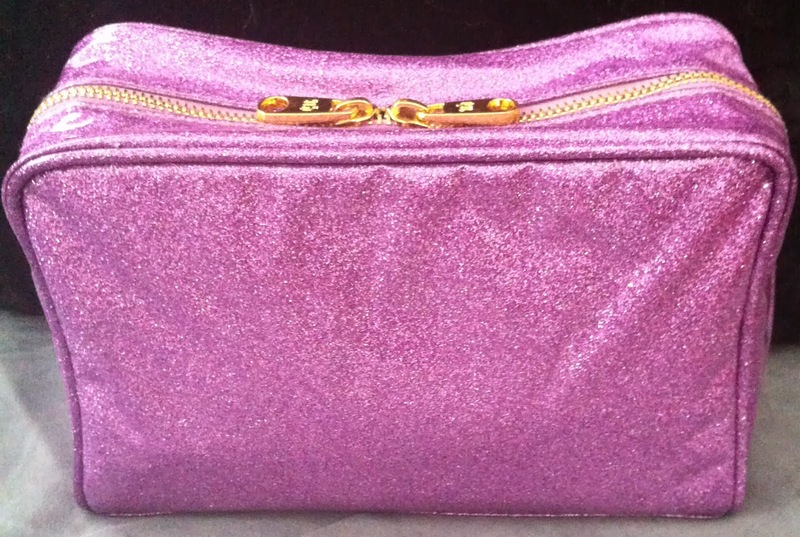 Nenta's Frivolity: What's In My Travel Makeup Bag? I'm going out of town for a few days (so fewer posts this week), so I thought I'd share with you what's in my travel makeup bag (this does not include skincare). I am not flying, so I don't need to worry about being FAA compliant. I'm just driving myself, so I can kind of have as large a bag as I want, but I'm only going for 2-3 days (or more, depending on the weather), so I don't really need much. I'm also just going to see family, but I like to be able to be fancy with my makeup if I feel like it. I tried to make this photo all artsy with stuff tumbling out of the bag. 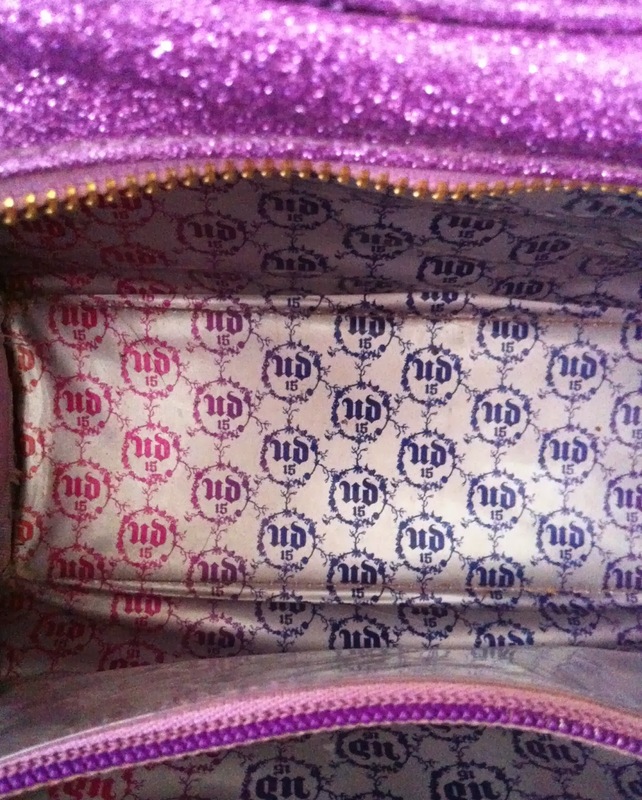 My sparkly purple makeup bag is the Urban Decay 15th Anniversary Quinceanera bag (no longer available). Stila Sheer Color Tinted Moisturizer -- This is my favorite "base" product. I don't usually wear a true foundation on a daily basis, but if we were going to get dressed up for any reason, I would take a foundation with me. Wet 'n' Wild Coverall Pressed Powder -- This just happens to be the setting powder I'm using right now. 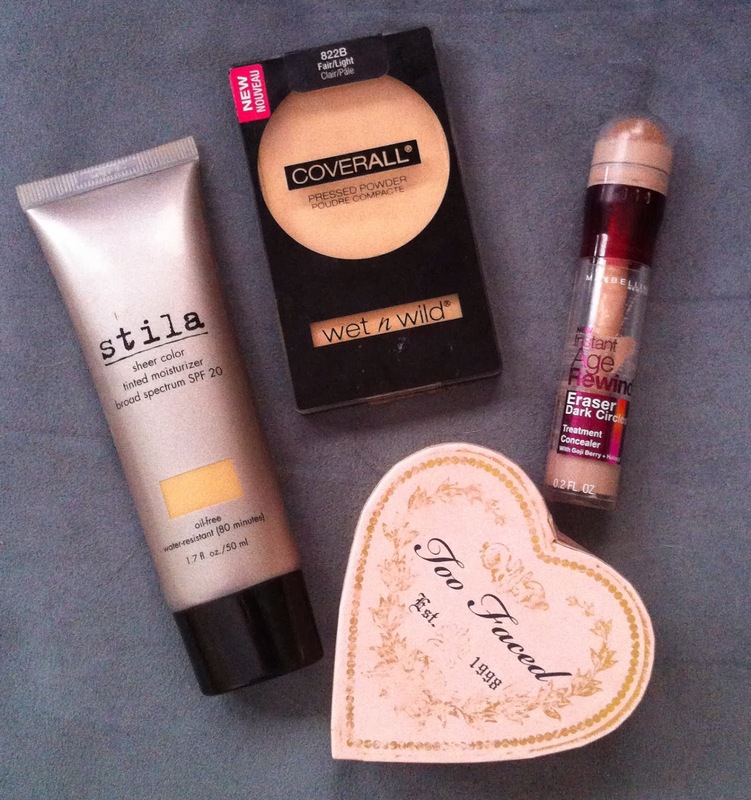 I want to try the Rimmel Stay Matte powder next. 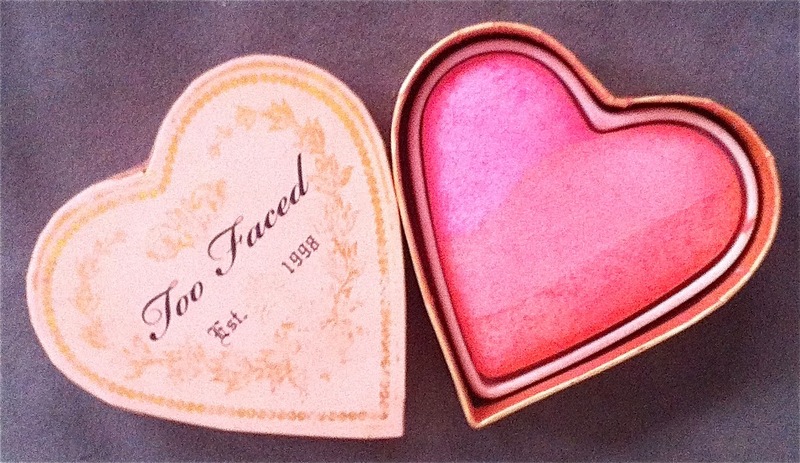 Too Faced Sweethearts Perfect Flush Blush in Candy Glow -- I like how this has pink and coral colors so it works with cool and warm-toned looks. 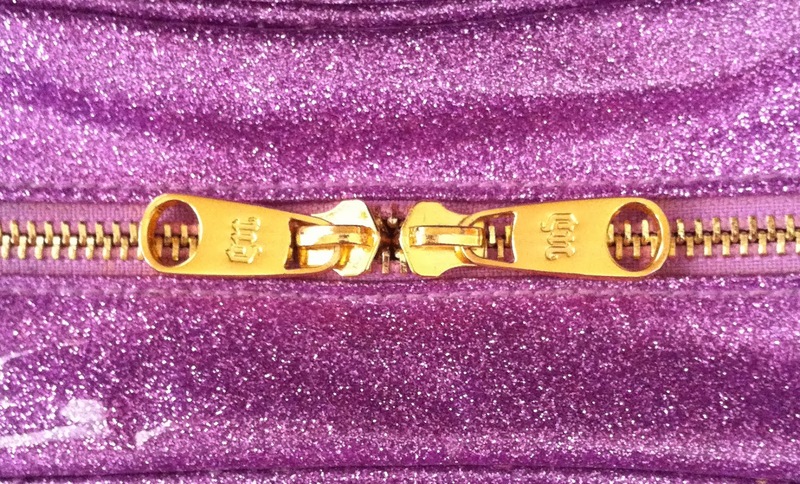 Plus, it has some light shimmer to it, so it gives a little luminosity to the skin, and I can skip the highlighter. Maybelline Age Rewind Eraser Dark Circle Corrector -- My favorite concealer. LORAC Creamy Brow Pencil in Auburn -- A pencil with a spoolie brush on one end is convenient. 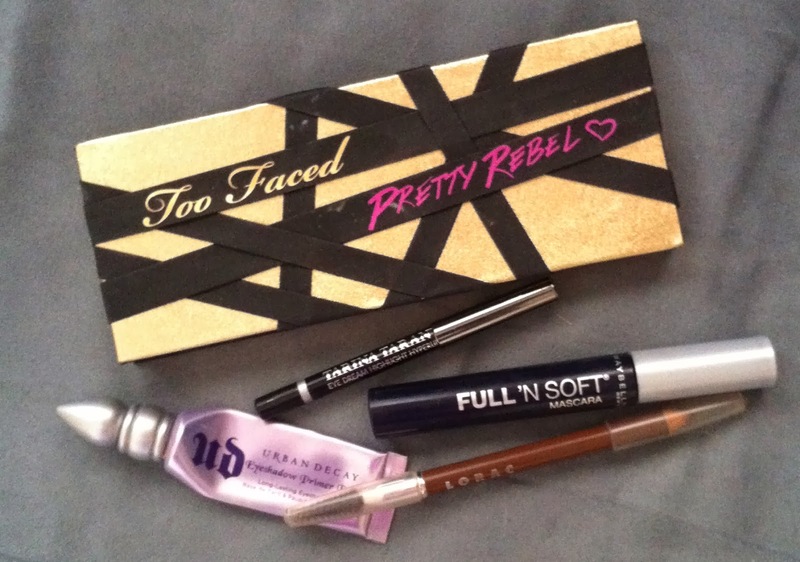 Urban Decay Primer Potion -- If I'm going to wear eyeshadow, I need a primer. (I don't feel the same way about traveling with face primers, because the serum I use in my skincare regime works as a primer if I want to use it as such). Tarina Tarantino Hyperliner eye pencil in Tommy Jet -- A great waterproof black pencil liner. Too Faced Pretty Rebel eyeshadow palette -- There are so many looks that can be created with this palette, and the shadows themselves are amazing. I could have picked the Naked or Naked 3 palette, but my family kind of gets a kick out of my colorful eyeshadows, so I chose this. Maybelline Full 'N Soft Mascara -- My favorite everyday mascara at the moment. I considered putting in my Benefit They're Real mascara, but I want something that removes easily, and I don't need the dramatic lashes that mascara gives me when I'm just visiting my family. Real Techniques Powder Brush -- It's a little on the huge side, but it fits in my bag, and it is currently my favorite powder brush. 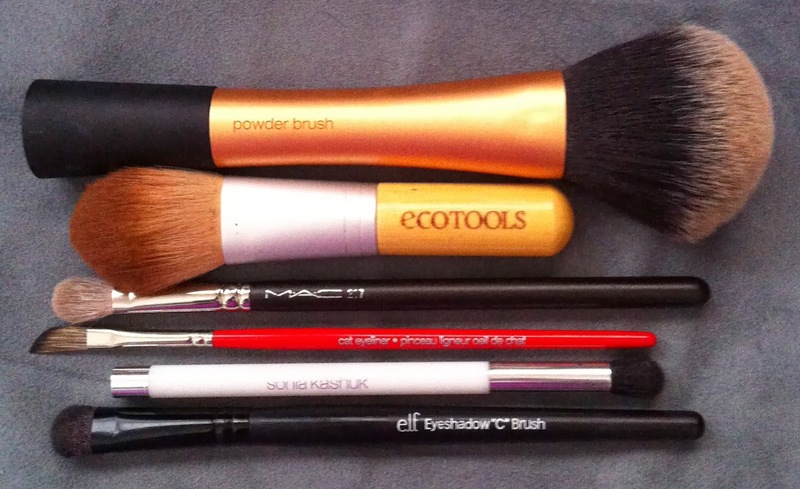 Eco Tools Travel Powder Brush -- I think this came in their 5 piece mineral brush set (I acquired it quite a while ago). I use it as a blush brush. Eyeshadow Brushes: E.L.F. Eyeshadow "C" brush, MAC 217 blending brush, Sephora Crease brush, Sonia Kashuk blending brush (it doesn't have a number or name on it), Sephora cat eyeliner brush (came in a set with another brush). 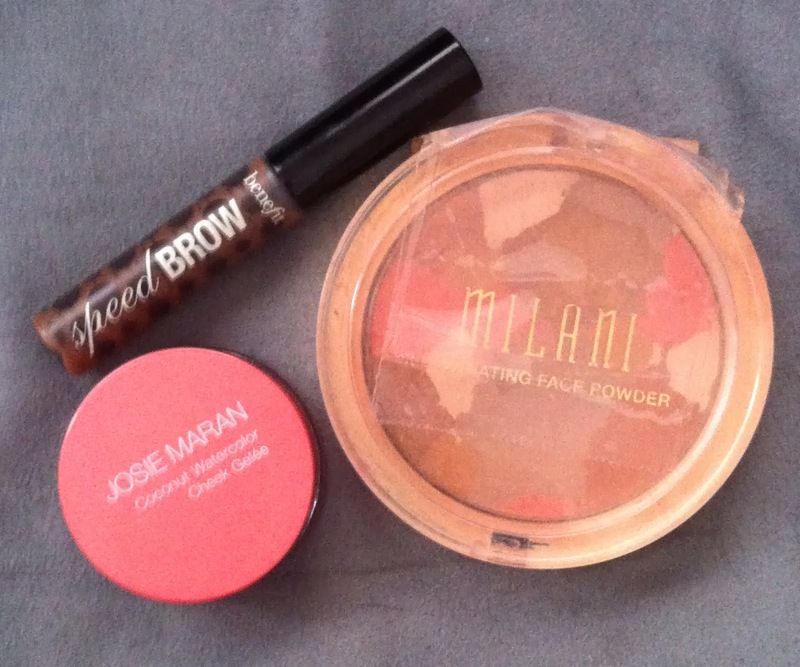 I also considered throwing in Josie Maran Coconut Water Cheek Gelee in Poppy Paradise, Milani Illuminating Face Powder in Amber Nectar (which is held together by packing tape), and Benefit Speed Brow brow gel. I haven't included lip products, because I carry those in my purse. I'll have to do a "what's in my purse?" post soon. If I was just going overnight, I would take less than this. Probably just tinted moisturizer, blush, mascara, brow gel, a cream eyeshadow so I can skip the eyeshadow brushes (I usually take Maybelline Color Tattoo in Bad to the Bronze), and what ever lippies are in my purse. How much do you take with you for short trips? Have you ever regretted not having something with you? I love seeing what people pack for travel. I would probably take about the same amount of stuff, though if it was just a couple of days I would probably just take a small eyeshadow trio or quad or something. But my travel plans almost always involve planes or trains so space is limited. It looks like you could have been FAA compliant if you needed to, since only a few of those things are liquid! I can't leave home without a huge eyeshadow palette. I'm a sucker for cute packaging, so that drew me in, but it turns out the blush itself is quite awesome.